REGISTRATION OPENS OCTOBER 8TH, 2019! EARLYBIRD $99 USD if you register before December 3rd. $129 After December 3rd 2018. IN 2019 Melinda will once again be participating in "Let's Face It." The 2019 course will focus on exploring different mediums including charcoal, acrylics, oils, colored pencil, pastel and more, all while working with both portraiture and figurative art. Melinda will be teaching one class using oil paint and one using acrylics, both working with the figure. This year long eCourse will be taught with video presentations by 22 different artists (see below) and will last from January 1st through early December, 2019, and is an amazing deal for the cost! The course is downloadable and students have access to it forever. What is included in Let's Face It 2019? 50 weeks of amazing stuff! Each week you will receive a BRAND NEW lesson that has never been seen before! While these lessons are all new, some of the techniques might be ones that you are familiar with. 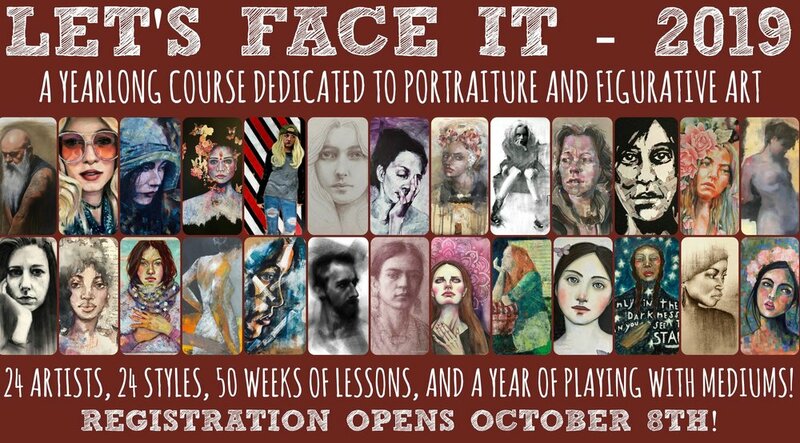 Some of the lessons will be full-length videos from the instructors that walk you step-by-step through their creative process in creating faces/portraits. Other lessons will be mini lessons, that share special tips and strategies to use as you are creating. Typically we will be rotating between a full-length and a mini lesson. This way you will have about two weeks in between the longer lessons. 24 PDF eBooks to go along with the main lessons. These will be printable and you can use them to follow along with the lessons. 39 Free Memberships to the class that you can win!!! Lifetime access to your course on Kara's site. LET'S FACE IT 2018 IS STILL AVAILABLE! You may have missed some of the personal interaction with the instructors, but there is still a HUGE amount to learn from the hours of videos, writings and Facebook commentary that you will have access to forever when you register. IN 2018 Melinda will be participating in "Let's Face It," a year long course that will explore the figure and creative portraiture as seen through the eyes of artists throughout the centuries. This extensive eCourse will be taught with video presentations by 22 different artists and will last from January 1st through early December, 2018. The course is downloadable and students have access to it forever. For FAQ's see below. As you may guess, Melinda will be teaching two lessons about the California Figurative movement using Richard Diebenkorn and Nathan Oliveira as inspiration. 21additional instructors will present more than 46 other historical artists from the Renaissance through Impressionism to Contemporary living artists in a year long journey of creativity! !